New Providence, The Bahamas – Accomplished Ophthalmologist Dr. K. Jonathan Rodgers, MBE, and Director of the Lyford Cay Foundation, Inc. Mrs. Alessandra Holowesko have been elected Chair and Vice-Chair respectively of the University of The Bahamas (UB) Board of Trustees at a board meeting held on Wednesday, 14th March, 2018. 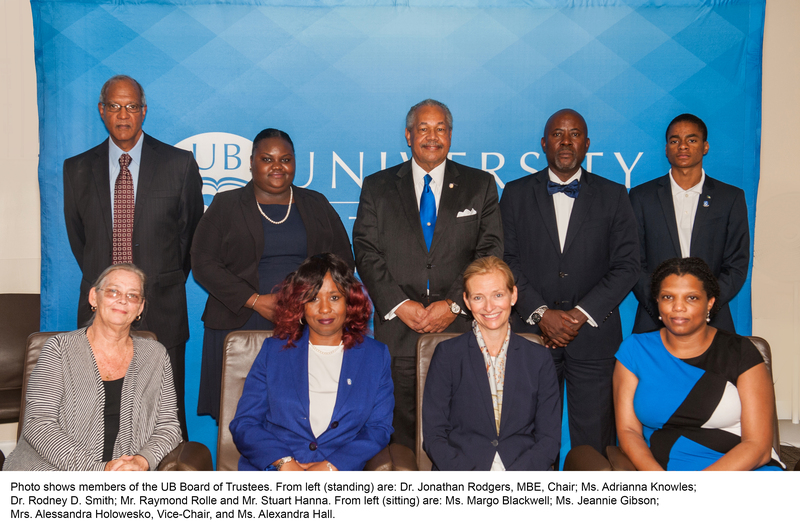 Legislated under the University of The Bahamas Act 2016, the Board of Trustees serves as the governing body of UB and is responsible for the general direction and control over the conduct of the affairs of the University. The Board currently consists of nine trustees. The UB Act prescribes that it may have not more than 21 trustees, appointed by the Governor General, representing various interests of the University and the public at large. In addition to the Chair and Vice-Chair, the other trustees include President of UB Dr. Rodney D. Smith, who serves in an ex-officio capacity; President of the UB Alumni Association Adrianna Knowles; Student Trustee Stuart Hanna (current President of the Student Government Association); attorney-at-law Alexandra Hall; Planning Assistant, UB Government & Public Policy Institute Jeannie Gibson; UB Associate Professor Margo Blackwell; and attorney-at-law Raymond Rolle. Considered a luminary in his field, Dr. Jonathan Rodgers has a distinguished career in ophthalmology and is a longstanding sponsor of the Anatol Rodgers Memorial Lecture series at UB, now in its 13th year. His professional experience spans more than 30 years, having served as consultant ophthalmologist at Memorial University in St. John’s Newfoundland and the Princess Margaret Hospital, The Bahamas; Assistant Clinical Professor at the Department of Ophthalmology at Yale University and Clinical Associate at Mount Sinai Hospital in Ontario, Canada. He also founded Centreville Optical (Bahamas Vision Centre) as his private practice. His research papers have been widely published in a number of international research journals and his books “Is it Really Better in The Bahamas…For Bahamians” and “The Bahamian Dream” were published in 2010 and 2013 respectively. A multi-lingual, Dr. Rodgers has also served as Honorary Consul to Nicaragua. The former President of the Lyford Cay Foundation (2011-2014), Mrs. Holowesko has served as an Education Committee member (2010-2013) and Gifts and Grants Committee chair (2002-2007) of the foundation. She was also Director of the Lyford Cay International School (2002-2005), Governor (2005-2014) and Chair of the LCIS Board of Directors (2006-2009). Until recently, she served as Director at the Believe Foundation, Baha Mar’s philanthropic endeavor. UB’s Board of Trustees will approve the strategic direction of UB; strategic policy matters; annual business plans, budgets and annual audited accounts; and review and monitor the management of the University and its performance. Trustees play an integral role by providing oversight and input regarding the University’s large scale programmatic goals and its financial and physical resources. They provide leadership in fundraising to sustain the University’s progress and serve as advocates for the University locally, nationally and internationally. Currently, UB is undergoing a sustained period of growth and development as it transitions to become a world-class institution. Infrastructure is being developed to support an anticipated 25% increase in student enrolment over a ten-year period. The University of The Bahamas system incorporates campuses, centres and academic offerings in New Providence, Grand Bahama, San Salvador and Abaco, as well as UB Online.